Can you handle these wicked funk grooves? Over 400 live funk loops and fills to inspire any songwriter looking for “the” groove! Takes the attitude of rock and infuse it with the syncopated rhythms of funk. Inspired by P-Funk 70’s-style funk, Motown, and RnB, you’ll get classic funk drum beats that hit it hard. You gotta have that funk! Multi-velocity samples are also included. 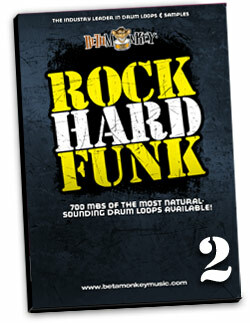 Rock Hard Funk II brings another round of serious funkiness to the Rock Hard Funk Series of funk drum loops. With 400 live funk grooves to inspire any songwriter looking for an inspired rhythmic foundation, this sample library takes the attitude of rock and infuses it with the “groove supreme” vibe of funk. Add a drum sound perfect for today’s mixes and you’ve got the perfect drum track solution for your funk songwriting. Scale down the drum set to its essentials and mix in equal parts of rock, pop, funk – the perfect recipe for bringing some rhythmic emotion emotion to your songwriting. Fresh and modern yet with a clear eye on the roots of funk and rock, Rock Hard Funk II will bring all the grooves you expect as well as ones that defy categorization. Solid grooves for rock and pop, syncopated grooves for RnB and funk, Rock Hard Funk II brings a signature blend of drumming straight from Los Angeles to your studio. A wide variety of tempos and feels offer songwriters a quick and easy way to to build funk rock, RnB flavored, or pop rock tracks that feel right and sound great. We also recorded the beautiful sounds of a maple Yamaha Phoenix acoustic drum kit, capturing all the rhythmic voices to complement the loops. 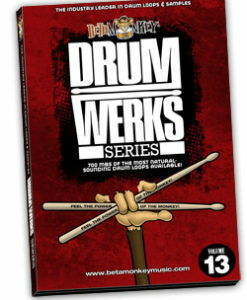 This matching set of drum and cymbal samples allow greater flexibility in drum track construction, whether you’re adding samples for additional flavor or using them in your favorite software to sequence new and fresh beats. 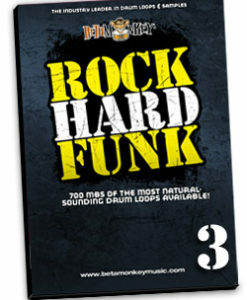 It’s all about the groove with Rock Hard Funk II, bringing the special groove sauce your drum tracks demand. 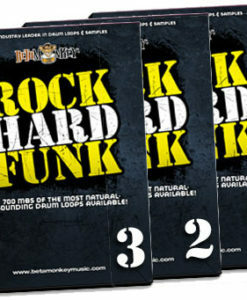 Rock Hard Funk II is also included in the Funk Drum Loops Bundle. Versatile mix of funk, pop, and funk styles: Whether it’s a straight 2’s and 4’s with a little hi-hat work or more syncopated patterns, a full array of rhythmic experimentation and feel. Superior Rhythmic Realism: Why settle for lifeless quantized monotony or, worse, lo-fi drums captured in a drummer’s garage or studio loft? Let Rock Hard Funk II bring well-tuned, professionally-recorded drums to your music. Dynamic groove energy with the sound to match.